Picture - Gago Coutinho and Sacadura Cabral on board of the Lusitx�nia. Carlos Viegas Gago Coutinho, GCTE, GCC, generally known simply as Gago Coutinho (Portuguese pronunciation: [ˈɡaɡu kowˈtiɲu]; 17 February 1869 - 18 February 1959) was a Portuguese aviation pioneer who, together with Sacadura Cabral (1881-1924), was the first to cross the South Atlantic Ocean by air, from March to June 1922 (some sources wrongly claim 1919), from Lisbon to Rio de Janeiro. The Fairey seaplane used by Coutinho and Cabral for their transatlantic flight did not have enough fuel capacity to make the entire trip unaided so various stops were made along the way and the aviators were shadowed by a support ship, Repx�blica. On the journey down the Brazilian coast a heavy rain storm caused the aircraft’s engine to fail and the aviators were forced to ditch in the ocean. Realizing that something was wrong, the Repx�blica sent out a distress signal asking other ships in the area to look out for the seaplane. After some time in the water, the aviators were found by a British freighter. The Paris City of the Reardon Smith Line, under Captain A.E. Tamlyn, en route from Cardiff to Rio, rescued Coutinho and Cabral; they completed their journey with a new aircraft. A commemorative painting of the rescue was produced by the Portuguese comic artist, Jos� Stuart Carvalhais (‘Stuart’). 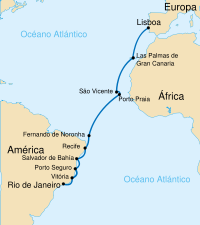 Picture - Route of the first to cross the South Atlantic Ocean by air. Gago Coutinho invented a type of sextant incorporating two spirit levels to provide an artificial horizon. This adaptation of the traditional marine sextant allowed navigation without visual reference to the real horizon.